Gordo has over 10 years of experience in producing a variety of events starting from weddings and all the way to business events while maintaining the best quality and professionalism. Our team in Gordo works according to your budget, yes- yours. There is no such thing as a too low budget. 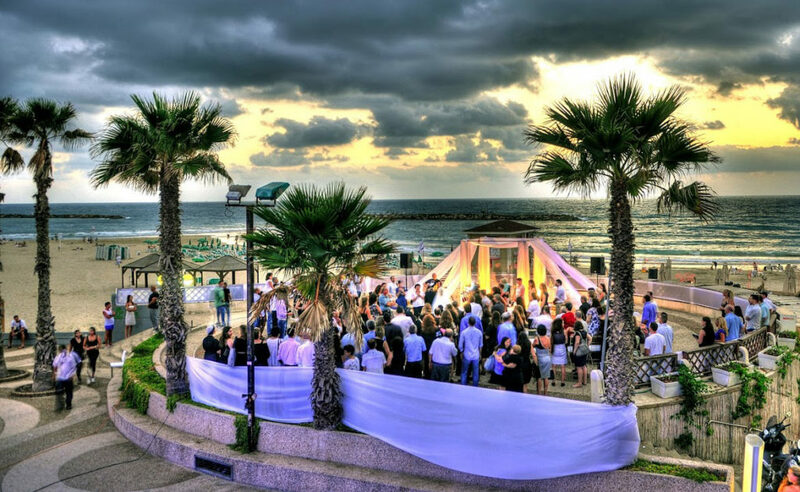 You will work with Ronen- “chef” of event producing, one of the owners and founders of Gordo, and what’s more… all of this happens within only 32 steps from the shore. Apart from the amazing view of Gordon Beach and the Mediterranean Sea, which is visible from anywhere in the complex, Gordo has audio and video infrastructures that allow for screening and greeting. In addition, the variety of furniture and the four existing levels allow you to create a wide range of seating models for your older and younger guests. If you are looking for a perfect and unique event by the sea- this is the place!!! We got married in April in Gordo. We wanted a small wedding (180 people), special, easy going and tasty- in Gordo we found all this and more!! Ronen Avni does a great job!!! He accompanied us from the first meeting, always with a smile on his face. He immediately understood what we were looking for and organized everything in best way possible!!! All along, Ronen took care of everything so that we will only have fun. The location- perfect!!! On the one hand with the perfect setting- the sea, on the other hand there is a closed complex. If you really want a different, fun and easy going event that on the one hand honors your older guests and on the other feels like your best time with your friends then you have it all here! We held a Friday afternoon wedding and we could not ask for better! Our budget was not big at all and Ronen did not let us for a moment feel that it was wrong and really did everything in order to adapt himself to us! During all the meeting with him of planning the event, he was always attentive and professional. He was asking all the right questions that we did not even think about! Ronen is simply a pleasant person who met with us even during uncomfortable hours and hosted us amazingly. He made sure our event goes perfectly. The food was excellent (until now I get compliments on the variety and quality of the food), an amazing number of waiters and bartenders (you didn’t wait for a minute to get your drink) and during the whole event there was a high level of cleanliness and order. The atmosphere in the place is simply magical and instantly puts everyone in a calm, happy and loving state. Everyone was just walking around with a smile on their faces, happy and drunk! Bottom line, it is strongly recommended to everyone who is tired of sleepy weddings and wants to feel the sea breeze, professional staff and amazing food! And most importantly at a reasonable price!! I really have no words to describe how much the decision to get married at Gordo was right! The place is magical, unique and the atmosphere there is amazing. The food is excellent and all the guests were thrilled over the special Huppah we had by the sea. Special thanks and much love to Ronen, the amazing manager! Ronen gave everything he promised and more. Took care of us, provided a calm atmosphere throughout the planning of the event and on the wedding day itself and was always available for any question or request. Thanks to all the Gordo staff for a perfect event!